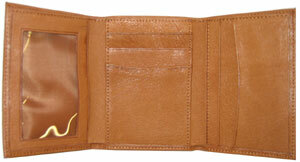 This trifold wallet is made from durable, top grain pigskin for a soft feel and long life. 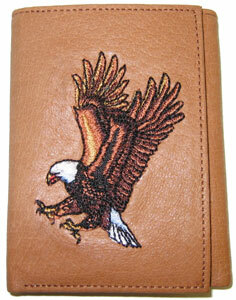 The front flap is embroidered with a Flying Eagle pattern. Featuring five credit card slots and one see-through Photo ID pocket, this wallet also features a bill holder lined with nylon to prevent dye absorption.. Detailed photos of the configurations are shown below.